Taking the family away this Easter? Heading for a sunny spot in the near future? Take advantage of these special bundle packs of SPF 50+ sunscreens specifically for you and your children. Save between £10 and £24 when you buy these limited edition bundles. But hurry, only available while stocks last! 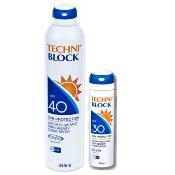 Our SPF 50+ sun protection is available in Techniblock's tried and trusted formula, as well as a Kids version, which has been specifically developed for children's young and delicate skin. Providing an average SPF rating of between 56-61, both SPFs offer high protection in a clean, breathable aerosol spray that goes on quickly and easily and absorbs fast. Free from oils, emusifiers, fragrance and colourants, the non-greasy protection feels ultra dry, sand won't stick and it doesn't need rubbing in (a bonus when kids are in a rush to run off and play). Techniblock SPF 50+ is extremely resistant to water and works hard to keep both you and your family fully protected, even in the water. We have some great deals available for a limited time only. Spend any extra £1 on the SPF 40/30 Value Pack and get 2 for the price of 1 (almost)! This limited edition offer includes an SPF 40 340ml sunscreen plus an SPF 30 75ml sunscreen for just £24 - that's a saving of £6.50 if they were purchased separately.